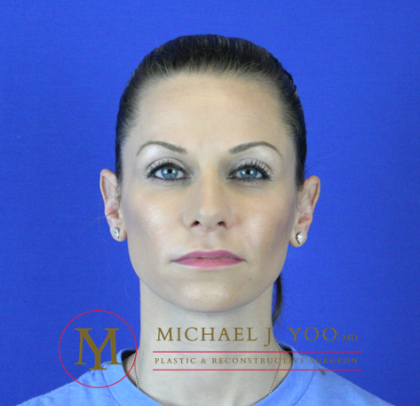 Patients in the Orange County area seek Dr. Michael J. Yoo to perform rhinoplasty for many reasons, including improving the shape of their nose, or improving breathing. This procedure can restore aesthetic balance and symmetry to the face, open up airways, and ultimately improve quality of life. 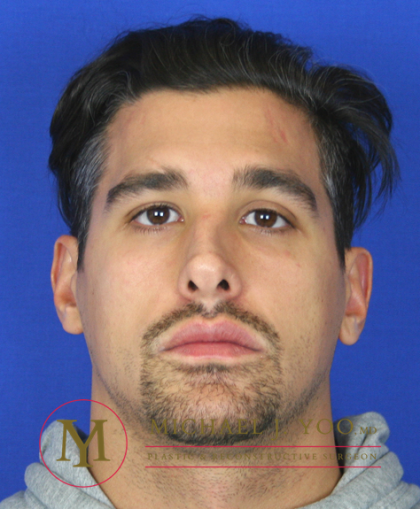 Rhinoplasty (also frequently referred to as a nose job, nasal reshaping, or septorhinoplasty) is a procedure most commonly sought by individuals who want to improve the appearance of their nose. Yet it is also a procedure that can dramatically improve the ability to breathe through one’s nose by correcting structural abnormalities that impair this very important function. During a rhinoplasty procedure, Dr. Yoo may alter cartilage, bone structure, nasal skin, or all three in order to achieve the desired results. 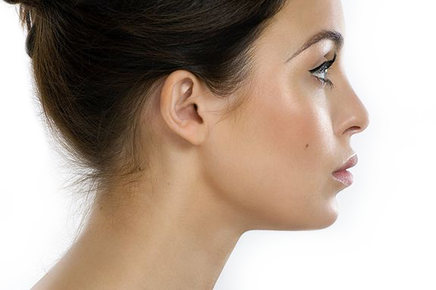 Rhinoplasty is widely regarded as the most challenging procedure in the field of aesthetic surgery. This complex operation requires an intricate understanding of internal nasal anatomy, 3-Dimensional shapes, different tissue types (skin, cartilage, mucous membranes), and long-term healing effects. It is a highly detailed and technical surgery and is a direct reflection of that particular surgeon’s aesthetic ideals. Given the delicate nature of this procedure, Dr. Yoo likes to thoroughly discuss its details in a step-by-step manner with all of his patients, as he strives for only the best results with each and every one. If you are considering this surgery, please schedule a consultation at our Orange County location and he will be more than happy to answer any of your questions. The objective of rhinoplasty is not to draw attention to the nose itself, but to divert attention to the eyes – what one normally focuses on during the course of a conversation. 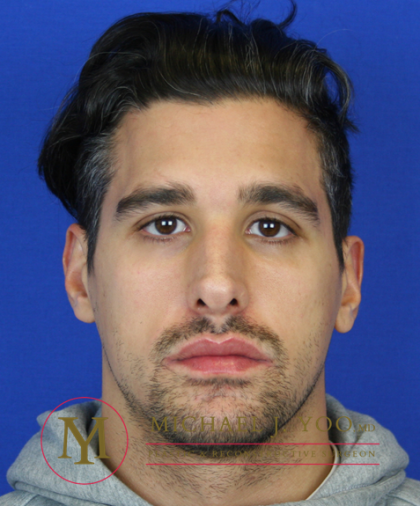 While his primary goal is to create a subtle, natural appearance, the result of a well-performed rhinoplasty can at times be dramatic with regards to the improved balance it brings to the individual’s facial aesthetics. Aside from bringing attention to the eyes, nose surgery can be performed to address many different nasal issues. These issues generally fall into one of two categories: functional or aesthetic. The most common functional problem with the nose is a deviated septum. A deviated septum is a condition where the cartilage and bone which divide the nasal cavities is crooked or off center, blocking the nasal passageway and making it hard to breathe. This condition can be present from birth or occur after injury to the nose. Reparative nasal surgery, otherwise known as septoplasty, can be performed to correct this condition. Not only will breathing become easier, but septoplasty also has the added benefit of producing a straight and symmetrical nose. There is no such thing as the “perfect nose”, but characteristics people consider to make up the ideal nose are straight, symmetrical, and “not too big yet not too small.” A rhinoplasty procedure with Dr. Yoo can reduce bumps on the nasal bridge, narrow the nasal bridge, widen the nasal bridge, adjust the size of the nostrils, and much more. By addressing nasal aesthetic concerns and enhancing the nasal profile, Dr. Yoo can bring symmetry and balance to the face. Facial growth must be complete before going forth with nose surgery; this normally happens in the post-teenage years. Some potential candidates may be hesitant to undergo nose surgery if they are concerned it will alter their ethnic identity. Rest assured that Dr. Yoo has many years of experience performing Ethnic Rhinoplasty, a specialty technique that enhances the look and functionality of the nose while keeping true to patient’s ethnic uniqueness. Consulting with Dr. Yoo at his Orange County office is the first important step of a patient’s nasal surgery journey. At this time patients will share their nasal concerns regarding aesthetics and functionality, as well as their desired outcome. He will perform a thorough exam, taking into consideration the nasal structure, overall facial structure, and skin quality. Afterwards, he will offer his expert opinion on which nose surgery technique will work best for the specific case. Since each patient’s anatomy differs, a customized surgical plan will be developed. Preoperative and postoperative instructions tailored specifically to the patient will also be provided to maximize optimal results. Pricing and insurance questions can be answered at this time. Rhinoplasty surgery can be classified as a primary or secondary operation. A primary operation refers to a nasal surgery performed for the first time. Surgeons performing a primary operation aim to enhance all functional and aesthetic concerns in that single surgery session. Secondary operations are performed when a patient is not satisfied with the outcome of their initial nose surgery or if unforeseen complications have risen. Dr. Yoo is highly skilled at performing rhinoplasty on patients undergoing nose surgery for the very first time, as well as fixing any issues or concerns rhinoplasty patients may have resulting from a previous surgery. Depending on the anatomy and desired changes, the technique can be performed via a closed or open approach. 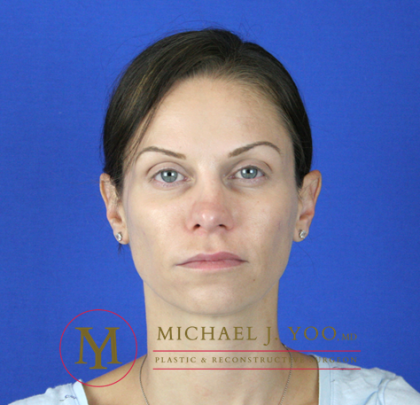 In a closed approach, the incisions are placed inside of the nostrils and will not be visible after surgery. In an open approach, the incision is placed on the thin bridge of skin between the nostrils, called the columella. This external incision heals extremely well when properly closed and in several months is virtually unnoticeable. The closed approach is useful for small modifications to the nasal bridge, whereas the open approach gives wider surgical access to the entire nose including the nasal tip. Dr. Yoo personally prefers the open approach in patients who desire a full rhinoplasty procedure that includes tip work, as it provides him the greatest exposure to the nasal framework and gives him the greatest accuracy and precision in making the desired modifications. 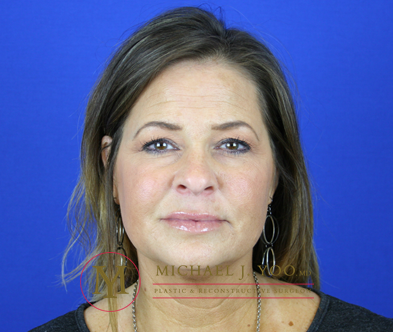 Rhinoplasty is performed on an outpatient basis under general anesthesia. The operation generally takes two to three hours to complete and, once completed, the patient will be transferred to a comfortable recovery room. After a couple hours of attentive monitoring by our friendly nursing staff, patients are free to return home to rest and recover. Rhinoplasty is a type of cosmetic procedure that can bring beautiful harmony and balance to the entire face; however, there are some procedures that, by accompanying them with nose surgery, can provide greatly enhanced results. As Dr. Yoo has stated, the goal of rhinoplasty is to provide results that naturally bring attention to one’s eyes, so what better complementary procedure than eyelid surgery? 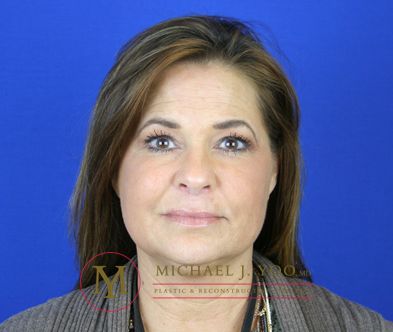 Blepharoplasty is a popular plastic surgery procedure that removes lax skin and fat deposits from around the eyes to create a youthful, alert appearance. After the procedure, it is important to keep the head elevated to minimize swelling. Gentle ice packing also helps with swelling and bruising and should be done frequently during the first week after surgery. Swelling can be expected to decrease significantly over the following three to four weeks and will continue to improve with time thereafter. In the closed rhinoplasty approach, the sutures used are generally absorbable and need not be removed. Only a thin film of antibiotic ointment is applied to the inside of the nostrils to cover the incisions. In the open rhinoplasty approach, fine sutures are used to close the small, external incision and are removed in six to seven days. While the sutures are in place, a thin film of antibiotic ointment is applied several times daily to coat the incision line. Dr. Yoo also instructs his patients to periodically clean the incision line with diluted hydrogen peroxide. This prevents crusting and clotting and helps with the healing process. It is important to note that while some of the improvements of rhinoplasty are immediately apparent, healing is a gradual process that varies from patient to patient. If the nose is surgically narrowed or a hump is reduced, a splint may be placed on the bridge of the nose to help mold the area and minimize swelling. Internal nasal splints are also placed inside of the nose if major septal work is performed. Both are typically removed in five to seven days. The cost of nose surgery varies based on the conditions being treated and the technique performed. A custom quote will be provided at the consultation after an examination. Some insurance companies cover the cost of septoplasty; please consult with your insurance provider before requesting a nose surgery consultation.